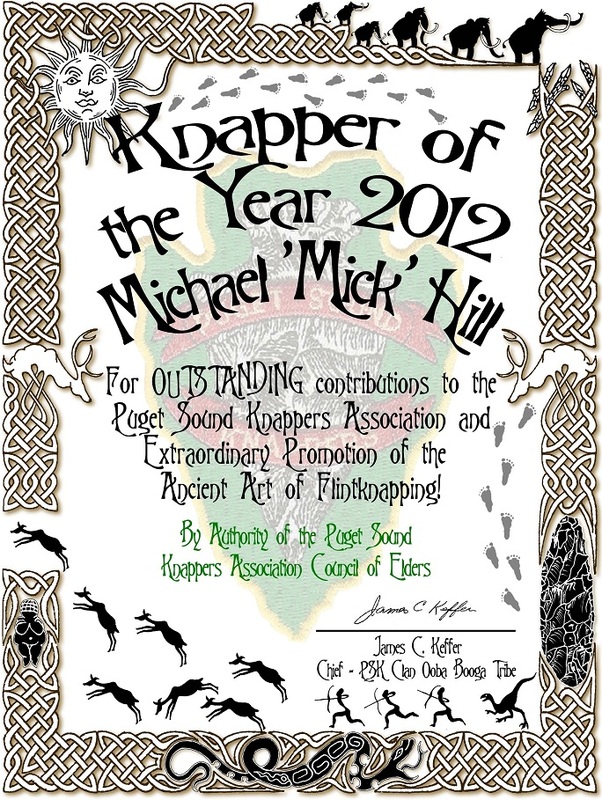 Puget Sound Knapper of the Year - Michael 'Mick' Hill' ! On behalf of the Puget Sound Knappers Council of Elders, Michael ‘Mick’ Hill was awarded the First Annual Puget Sound Knapper of the Year Award for outstanding contributions to the PSK Community of Knappers! Signing for the Council was Ooga Booga Chief Reefer (aka James C. Keffer). 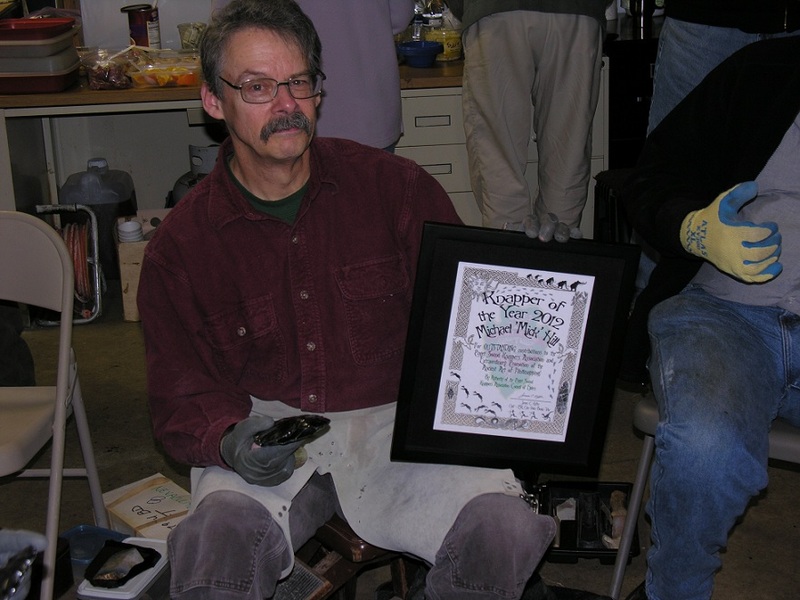 Mick Hill started flintknapping in 1969 and joined the Puget Sound Knappers in the early 1990’s. He epitomizes the spirit of the Puget Sound Knappers – willing to help wherever, whenever and at whatever is needed to support our community of knappers. Mick, and his wife Holly, have hosted 16 consecutive annual Knap-ins. He has demonstrated flintknapping to countless groups and individuals; scouts, Pagans, rock hounds, strangers, friends, neighbors and anyone else who showed the slightest interest. He’s taught dozens of noobies and been responsible for recruiting many of our new members by his enthusiastic promoting of this ancient art. of the PSK knap-ins in 2012 (as well as hosting one himself), he taught and demonstrated flintknapping at all the knap-ins he attended as well as several other events including the Cabelas Lacey Store ‘Mini’ Knap-in and Pagan Gathering in Puyallup, WA. Even a brief look at the various 2012 knap-ins and one realizes how dedicated Mick is to helping others. It was at these two events where Mick faced his greatest challenge as a flintknapper. While demonstrating and teaching knapping at Cabelas in January, a group of sightless people stopped by. vOne of these individuals, Marty Cartwright, wanted to try her hand at flintknapping. Undaunted by her inability to see, Mick rose to the task and with an hour or so Marty produced her first point! Just a few weeks later Mick was invited by the local Pagans to demonstrate flintknapping and their annual ‘Gathering’. While there who should show up – Marty and one of her blind friends. Mick gave them both instruction on flintknapping with result similar to those at Cabelas. Mick even gave them lessons on how to use an Atlatl. With a cell phone ringtone as a target (phone was protected by a block of Styrofoam), Mick was able to teach them to use the atlatl to throw a dart at the sound of the ringtone! Mick has certainly a high standard for future PSK Knapper of the Year! Mick and his Flintknapping Tool for the Blind - a combination walking stick for the blind and fully functional, 5 foot long, copper-tipped Ishi Stick.